VasSol’s NOVA (Non-invasive Optimal Vessel Analysis) is the first and only product line to non-invasively quantify the volumetric blood flow rate in vessels of the brain. for volumetric blood flow calculation. NOVA provides physicians with the flexibility to evaluate entire vasculatures or pinpoint specific areas within a vessel that may be of concern. NOVA is easily incorporated into your MRI services. A NOVA PC is linked to the MR host system and processes the data from a standard MRA study. NOVA uses traditional time-of-flight (TOF MRA) and phase contrast magnetic resonance imaging (PCMR) to visualize the anatomy and quantify blood flow. The NOVA PC is linked to the MR Host System. Additional networked PCs are available for the radiologist and referring physician to review the results. What information is included in the NOVA Report? Click here to take a look at a NOVA report sample. For more information about how NOVA works, please contact us. Pre-Endarterectomy, NOVA quantifies the reduction in right internal carotid flow and establishes a baseline for this patient. 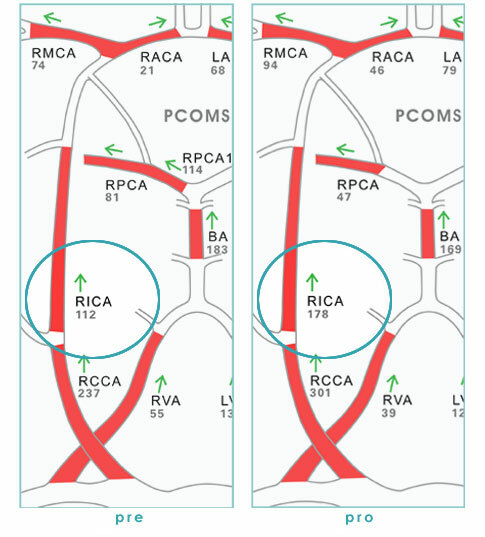 NOVA documents the quantitative improvement in right internal carotid artery flow after endarterectomy. Note the collateral supply from the right posterior artery before endarterectomy. 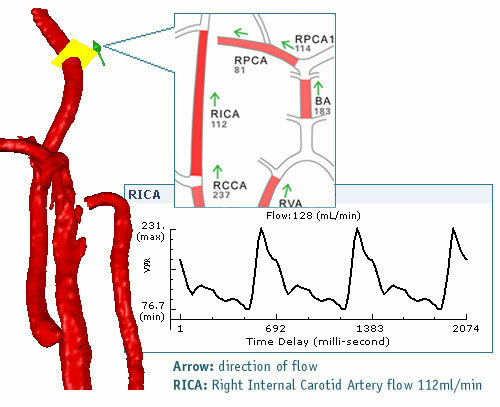 After endarterectomy, right middle cerebral artery flow has improved and there is a corresponding decrease in the compensatory flow from the posterior circulation.